Britain’s dominions have followed the mother country into war with Germany. Now New Zealand sends a force to occupy Germany’s Pacific colony of Samoa. The Germans surrender without a fight. The Germans complete their destruction of Samsonov’s army. 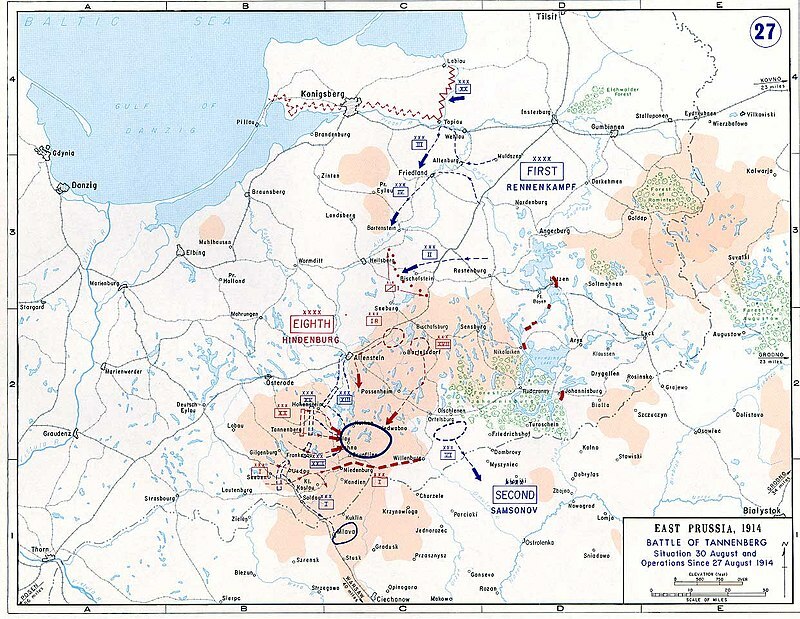 They have driven in the Russian flanks and pounded the enemy with artillery. 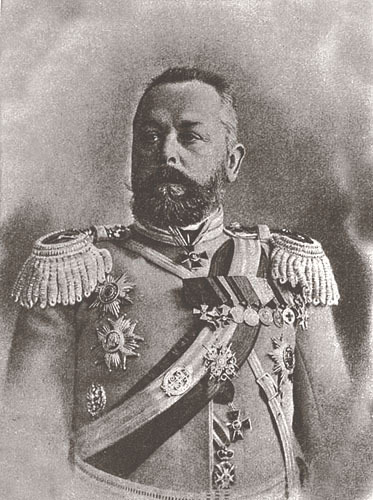 When the Russians try to retreat, they find their way blocked by a German army corps under General von François. The Russians lose 90,000 men killed and 90,000 captured in just five days of fighting. The Germans also capture hundreds of field guns. Only 60,000 of Samsonov’s 230,000 strong army escape. Samsonov himself is not among them; unable to face the shame of this terrible defeat, he has shot himself. This triumph makes Hindenburg and Ludendorff heroes in Germany. Hoffmann will not receive the same recognition, though the staff officer will always claim that it was his plan that secured the victory. The battle is named Tannenberg, after a nearby village where the mediaeval Teutonic Knights were defeated by Slavic forces. The French and British are retreating everywhere… or almost everywhere. General Lanrezac’s 5th Army has been ordered to counter-attack at St. Quentin and Guise, to buy time for the rest of the French army to retreat to secure positions. At St. Quentin the French are repulsed with heavy casualties, but at Guise troops under General Franchet d’Esprey push back the Germans. But this is just a temporary victory. In the face of vastly superior German forces, Lanrezac’s forces break off the engagement and resume the retreat. The Germans do not contest their withdrawal. Since the start of the war, the French have suffered 260,000 casualties. In total, 75,000 Frenchmen have already lost their lives. Elements of the British and German fleets clash in the Heligoland Bight, off Germany’s north sea coast. The battle begins as an action between small ships but the British eventually bring up the battlecruiser squadron of Vice Admiral Beatty. The battlecruisers sink some German light cruisers and damage a few others. Beatty is hailed as a hero on his return to Britain. Samsonov’s Russians are still pushing forward, confident of an easy victory against an enemy they see as beaten. But now the Germans are ready to strike back. They have concentrated the bulk of their forces against Samsonov’s army and now they attack. 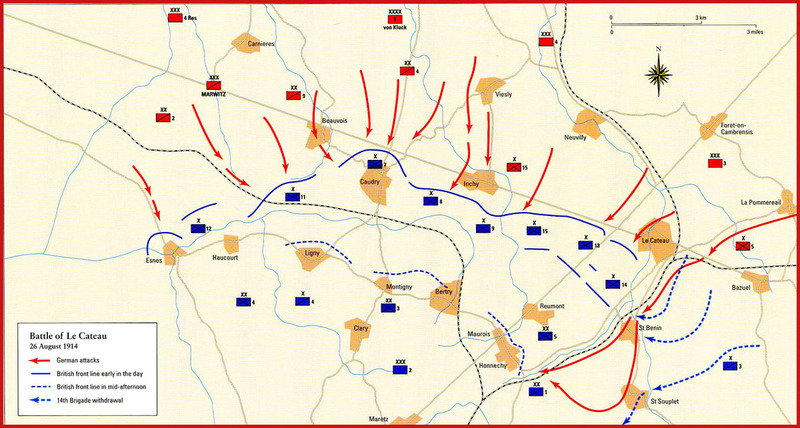 German forces start to drive in the right flank of the Russians. The British are retreating into France from the advancing Germans. At Le Cateau, some of the British Expeditionary Force makes a temporary stand. They are commanded by General Smith-Dorrien, who fears that they will be overtaken and defeated piecemeal if they keep marching. They hold the Germans off for a couple of hours but their position becomes increasingly desperate, with the enemy threatening to turn heir flanks.The British resume their retreat, covered by French cavalry. Austro-Hungarian forces invading Poland win another victory at Komorow. But further to the east, things are not going so well for them. Austro-Hungarian troops advancing from Lemberg in Galicia find themselves facing the main Russian force. Tough fighting ensues, with things increasingly going the way of the Russians. The Russians are commanded by General Alexei Brusilov, who drives his men to inflict severe punishment on the Austro-Hungarians.